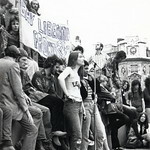 These images relate to LSE Library’s spring exhibition Glad to be Gay: the struggle for legal equality. It draws on the unique Hall-Carpenter Archives and the Women’s Library collection to mark the 50th anniversary of a pivotal piece of legislation: the 1967 Sexual Offences Act. Before that, homosexuality was a criminal offence. With the passing of the Sexual Offences Act, homosexuality in private was decriminalised, but genuine parity still was not achieved. The struggle for legal equality continued and has only made progress by the sustained efforts of committed activists. Emmeline Pankhurst speaking to a crowd, c.1910. Emmeline Pankhurst and Emmeline Pethick Lawrence, c.1910. Emmeline and Christabel Pankhurst in mock prison garb, 1908. Emmeline Pankhurst speaking at a Women's Social & Political Union (WSPU) meeting, 1912. Evelina Haverfield and Emmeline Pankhurst in court, c.1909. Laurence Housman and Clemence Housman, c.1910. GLF Gay Day, Holland Park, 1971.